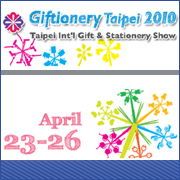 Trade Asia (AsianNet) was at Giftionery Taipei 2010 again this year. From April 23rd through 26th, Taiwan’s largest and best B2B gifts and stationery purchasing exhibition celebrated its 64th anniversary with 3 day events. This annual trade event gathered around 430 exhibitors from Taiwan, Korea, Japan, Hong Kong, Nepal, China, India, Peru and countries from Central America, and thousands of buyers and visitors from near and far. It is a great opportunity for Trade Asia to serve buyers face to face, by matching their sourcing demands with manufacturers of innovative gifts and stationery products in Taiwan, and in the meantime, Trade Asia promotes local B2B suppliers on a world class B2B platform. Trade Asia connects buyers and suppliers since 1996. It has been one of the most reputed online B2B marketplaces in the world. Trade Asia currently registers more than 700,000 corporate members worldwide; showcases well over one million products, and provides enormous trade opportunities.